For anyone who's spent any time researching investment ideas using the world's favorite source of readily-available information, the Internet, the concept of an online stock pump is hardly a new one. You may have seen such an operation underway recently for any number of small cap companies. 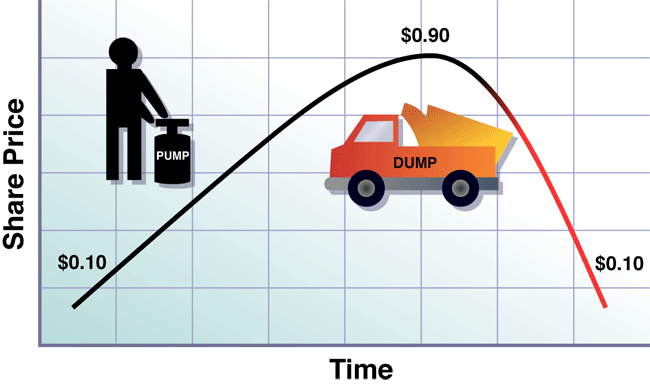 The entire point behind a pump and dump is for early shareholders to profit. Some person, or some group, buys shares or is given them from the company. They then sell their shares at a premium to other investors who want to buy the stock. In a pump and dump, the only thing that matters is hype. Fundamentals are out the window. It's basically a Ponzi scheme for stocks, where the first in make the most. So is it worth taking a chance? We're not saying every stock promotion is a scam – but you should certainly do your due diligence before becoming involved in any investment... especially one that just happens to find its way into your email box, unsolicited. One way or another, pump and dumpers get access to databases of email names. Despite attempted regulations by the government, despite lawsuits by the SEC, and despite a crippling economic crisis which, one would think, would make anybody with money to spend on stocks more careful and diligent than ever... these guys are still lurking, still growing, and still causing damage to our faith in the stock market with every email they send. I've made it a bit of a hobby to watch these guys – to study them and their habits – and most importantly, to study their effects on the stocks they promote. Just last week, I watched one of these promotions hitting some unprecedented numbers. What I saw happen was a real eye-opener for a lot of people, including other financial journalists. It's inspired me to write a quick and dirty summary of what I've learned about the shady newsletters and the paper stocks they manipulate. You're sitting at your computer, minding your own business, when your email inbox icon beeps (or burps, or clicks, or does whatever it does to alert you a new message has just been received). It's these stock pickers again, trying to get you to buy their stock. They never introduce themselves by name or with any sort of personal history or background, but the advice they give is confident, to the point, and loaded with big percentages and eye-popping dollar values. You know how it works, though. These guys promote the company through constant email bombardment, and if you get in early, you could potentially sell for a huge profit. For some reason, you always seem to hear about it too late to get in on the real meat of the profits. Or maybe you're just too gun-shy to try. The pick is five days away, and they're only now first mentioning it. For our new subscribers, Welcome! We hope everyone is enjoying very happy holidays right now. Today is the first business day since Christmas and we are already back at work. Our last pick went from 5 cents to $1.50 at its high. Our members could have profited from 3,000% gains on that one pick alone. We have a brand-new pick we will be officially announcing right after the New Year. As we study this pick and build a full profile for our members we are also giving you a heads up to have it on your watch list. Stock X will not only be our first pick of the coming year but we are hoping it will eclipse all our previous picks of 2011. But wait one freakin' minute here! Stock X is the pick? What happened to January 2, 2012?! Our members have had an extremely successful 2011 with our picks gaining a compounded 50,000% and more for the year if getting in at the moment of our alert and profiting on top which many have been able to do! Technically that would've turned $5,000 into $2.5 million dollars... not too shabby for a year's work. Be sure to watch all our picks in 2012 like a hawk! It doesn't do a thing to explain what this Stock X thing is, but it's good to know that somebody, in theory, could have made $2.5 million. It should be on your watch list. It definitely is on ours. Happy Holidays! Could I be among the very first who gets in on it – if I can get it TODAY? Back in that first week, the price of this particular anonymous penny stock was already long gone from the seven cents mentioned in the email. Instead, it was trading at about $0.40. Average daily volume: less than one million. With your email securely in their database, the pumpers will now commence a campaign lasting anywhere from several days to several weeks – or even months. Stock X could soar at any moment – You don't want to miss out‏! Click on any of the subject lines during the Blitz Phase, and you're likely to see the same sort of copy – repackaged, reshaped, but basically aimed at getting you to do the same thing the original announcement was designed to do: BUY. And if you've already bought, the goal is to get you to buy more. A spark lit up Stock X right before the close yesterday and now it's off to the races. It seems like the climb is continuing and the short-squeeze is getting tighter. At this rate we will see $1 before the end of the week and go into the multi-dollar levels starting next week! According to IRI Stock X could continue soaring towards the $5 target they have set for it and they recommend a "strong buy". Those of you who have been patient since the beginning and continue being patient are being rewarded for continuously holding. Stanley, UBS, Barclays and many others agree! We could have a very exciting last 2 hours of trading! Keep your eyes glued to the screen! Compelling stuff, I know. I could just imagine getting something like this around the close of business at the NYSE, feeling the sweat build up around my collar at the thought of what sort of opportunity I'd missed out on. If I went and looked at the symbol, I'd see that not only has the stock gone up 15% that day, but the volume was now about five to seven times what it was just five days earlier when the first announcement posing as a teaser was released. If only you'd bought when we first recommended, you'd have already more than doubled your money... but if you buy now, 400% gains are still very possible – probable, even – in fact, almost guaranteed! At its very height, the blitz will raise average daily volume from less than a million before the announcement to a peak of about 30 million shares traded daily. What readers don't know is that on some of those days, as much as half of the volume is coming from insiders – some buying, but many others selling. At 80 cents, some of the trades from the early moments of the promotion will yield a handful of insider stockholders hundreds of thousands. In one case, a $7-plus million share trade at around 80 cents (several weeks into the promotion) would have brought in $5.6 million – a profit of over $2.3 million. And who makes these huge profits possible? Well, the readers do, of course. To them, the stock is going to $5, making an 80-cent buy-in a major bargain. Unfortunately, the old adage "anything too good to be true, probably is" was custom-built for penny stocks. Just when you think you've made a killing and are on the way to double or triple your annual income... reality has a way of coming back to haunt you. Nine weeks after the promoters first got their hands on Stock X, the email subject lines took the sort of turn that makes investors start eyeing high-rise windows from which to leap. Stock X has retracted dramatically since hitting almost $2 earlier this week. While it is very sad and definitely annoying emotions should play no role in investments. Stock X seems to have long term potential and this two-day retraction should hopefully mean nothing in the mid-long term except maybe a massive opportunity to buy at cheap levels. No matter how we look at it Stock X is a huge winner as it is still up nearly 800% since our initial alert! While this short-term swing and panic may be nerve racking do remember that the research firm still stands firmly by its $5 target on Stock X. It also still stands firmly on its "STRONG BUY" recommendation. This means we may still be looking at 1,000% gains from current levels for those clever enough to look past the storm, and notice that Stock X is still as solid as it was just a few short days ago. While it may be on a small downtrend we have seen this happen just a few weeks ago, and it recovered right back from it and reached brand-new highs. There is still a tremendous amount of shares being traded. The volume is very high which shows that there's still a lot of interest from everyone. Those who thought last week that they had missed the opportunity to make gains on Stock X may be happy when looking at the opportunity that's been created today for them. Stock X is still healthy, strong, and as promising as ever! The day of trading, however, was anything but. It closed at around 94 cents – or about 43% down from the peak of $1.64. Promoters generally refer to this as a "short-squeeze." In other words, they're blaming a group of mysterious short-sellers who are greedily driving down stock prices with their short-sales. Stock X is closing onto 2 bucks very, very fast! Shorts have been getting continuously squeezed since the 70-cent range and we are now in a full blown out short-squeeze that is giving shorts a dose of their own medicine. Of course, it's possible that this stock is getting shorted. But realistically, most investors sophisticated enough to short a stock wouldn't bother with something so volatile. The more likely culprit here is that all those insiders who bought up million-plus share positions early on in December and January are starting to dump their shares onto a very flimsy artificial market. At the peak of this sell-off, trading volume was routinely above 50 million shares per day, or about 5,000% higher than it was when the promotion started. Unfortunately for hapless readers of this newsletter, most of those shares were panic-sales executed as the stock plummeted below the 40-cent price where most of them bought in. As little as several million shares dumped by the insiders is capable of precipitating this sort of collapse. You'd think at this point, with their profits and fees in hand, the promoters would call it a day and quit... right? Eventually, with enough work, enough spam, and enough new names pouring in through organically-generated traffic, the selling tide abates and the market moves again. This stock bottomed out at 40 cents on February 10th, less than three days after hitting its high. On that day, several huge chunks of stock were sold, totaling proceeds well into the millions of dollars. So this move effectively backstops the drop – and allows for the next wave of promotional emails to make their impact on the market. To all our new subscribers, welcome. We are very happy to see that a very large number of you are sticking to Stock X. Those of you who understand the market and how it works clearly understand why holding on to Stock X can put a lot of money in your account, as it already has time and time again. Stock X TAKES HUGE LEAPS EVERY TIME IT ANNOUNCES GOOD NEWS. If we observe the market trends of Stock X; we notice a certain pattern. Every time Stock X announces something new and exciting, the stock flies sky high and then after a while, it settles down just a bit. Essentially what this means is, many people are just trying to make a quick buck, but these people do not realize that the long term profit potential of Stock X seems WAY more promising than the short term gains. As you surely realize our pick of the year started soaring on Friday once again. It went through a rough two-day period, but the downtrend was short lived. In the next couple of days, the price does indeed recover, maybe as much as doubles from its low to hang around 60 cents. Unfortunately, despite the best efforts of the board of directors, the PR people, the attorneys, or anybody else in the position to publish some sort of positive news about the company in question, their main source of investor interest is fleeting. Congratulations to everyone who made big bucks on our previous pick. We initially announced it at 7 cents, and it ended up hitting nearly $2. We are going to be announcing a brand-new pick on March 1st the company is absolutely amazing. Most, in fact, probably bought it well past 40 cents – the price of the stock when the first promotions hit the Web on December 27th. Either way, it was over. The stock closed at $0.20 on the day the new recommendation was announced – down 40% from the previous day's close. It was back to about half of pre-promotion prices, and with no legs left, the campaign simply faded to nothing. Of course, the story of its demise isn't yet complete. To see it play out completely, we might have to wait weeks, maybe months... and nobody knows for sure just how far it fall, as only amateur day-traders are left holding the balance of the outstanding shares. All we know, based on the pumper's subject line, was that any chance for more gains pretty much went up in smoke the moment a new pick was announced. There are promotions, and then there are pumps. Legitimately promoting stocks is accepted, ethical, and if done right, profitable for everyone - investors and owners alike. It's what every commercial you see or hear on television, on the Internet, on the radio is basically designed to do. When you watched the Super Bowl and waited for those killer half-time ads, what you were looking at was a plain and simple promotion. For companies that can't afford to shell out $2 million for a 30-second national spot, promoting via the Internet, or even direct mail, is a tried, true, and yes, legal method of increasing cash flow, growing market capitalization, and securing additional financing for future projects. An evil third cousin of promoting is pumping. Designed to be little more than a short-term artificial market, pumps generally last only as long as it takes for those who financed the pump to drop their shares on their less-than-informed readers. Some are quick cut-and-run overnight-type deals with just a few emails blasted out into the ether of cyberspace a couple times before vanishing forever. Others – like the one I described above – are longer, more intricately-orchestrated affairs that can cause literally hundreds of millions of dollars to change hands. Usually, the best way to tell the difference is by looking at the source of the emails. If you're reading updates and alerts from a nameless author – chances are, it's a pump. If the text of the update or alert contains as many exclamation points as hard facts about the company – chances are, it's a pump. Finally, if you're being promised 100s of percent gains if you just hold out through another day or two, hang tough through the short squeeze – or better yet, double down on the dip – chances are, it's a pump.